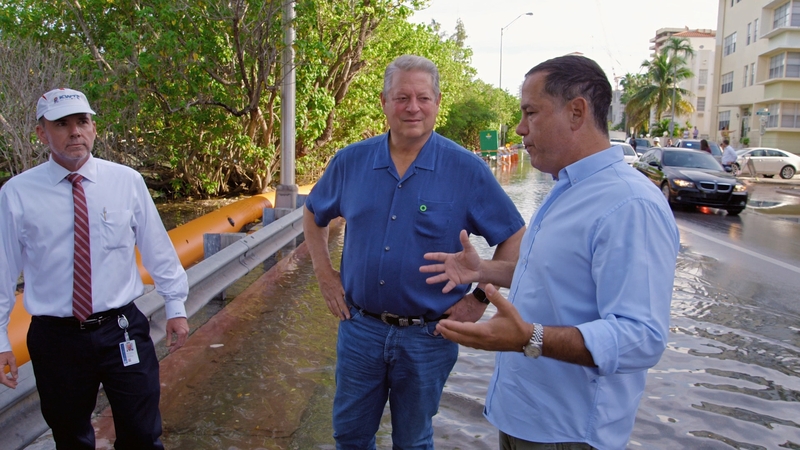 Al Gore is both the best thing and the worst thing to happen in the fight against global warming. The best because before his 2006 movie, An Inconvenient Truth (which won the Academy Award for Best Documentary Feature), there wasn't a whole lot of public knowledge about exactly what global warming (or "climate change" if you will) was - at least among your "average Joe" citizen. But he's also been the worst because, due largely to his political background, only half of Americans tend to believe anything that comes out of his mouth, despite the facts and figures he brings to the table. Regardless, it's hard to deny that Gore's 2006 movie brought the environment front and center, and it's been a leading topic (both pro and con) for politicians of every ilk for the past decade. 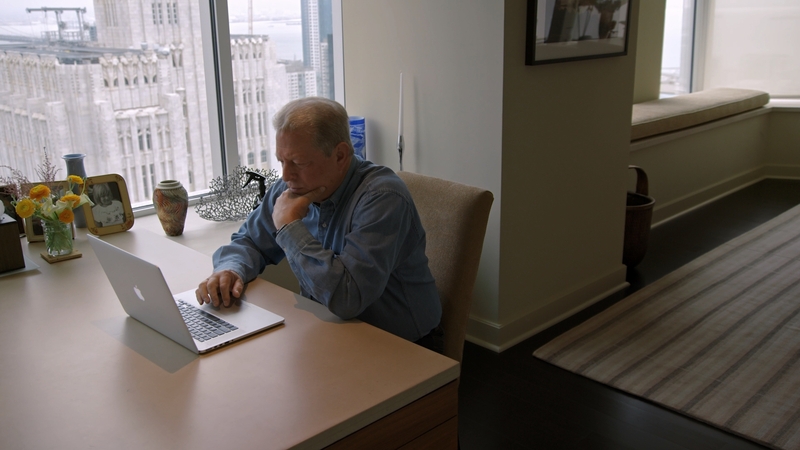 To mark what's happened both environmentally speaking and politically speaking in the past 10 years, Gore and company have decided to give us an update. But after viewing An Inconvenient Sequel, I had to question whether the movie needed to be made at all. There's not much new news to report here, and the filmmakers (the movie is directed by Bonni Cohen and Jon Shenk) can't seem to decide if they want their title to be about the environment, political obstacles, or just a look at the life of their featured spokesman, Al Gore himself. The first part of An Inconvenient Sequel is the best part, as viewers are treated to Gore giving a presentation in front of a large audience - much in the same way he did in the first movie. Then it's off to Greenland, where he takes a first-hand look at a glacier that is rapidly melting. He also heads down to Miami, Florida, where the tides have been increasing, causing the mayor and others to try and put a plan in place to pump out all the extra water. The movie starts to lose focus after the first thirty or so minutes, however, taking a side road into Gore's personal and political history - almost as if the filmmakers didn't have enough new material to cover, so they decided to focus on the man instead of the topic. The last third or so of An Inconvenient Truth spends most of its time covering the Paris Agreement - yes, the one that President Trump decided to pull the United States out of shortly after taking office. As important (even if only symbolically) as the agreement might be, watching the political players debate it behind closed doors is even more boring than it sounds. One of the best moments in the movie is actually an argument from one of India's economic advisors. Arriving in the country for a sit-down talk where Gore hopes to convince the Indian government not to pursue a focus on fossil fuels, the advisor tells Gore that it's hypocritical of the United States to ask a poorer country like India not to elevate their standard of living through fossil fuels when the United States spent decades getting rich off of their own natural resources and only now - after they've depleted most of them - are they asking other countries to join in on environmental responsibility. It's actually a great (if ultimately flawed) argument and one Gore doesn't have a good answer for, only able to respond by saying he can't see a blue sky when he looks up in India. Ultimately though, this sequel is more of an update to the first movie than anything groundbreaking on its own. Gore and those involved might have been better served just re-releasing the first movie on Blu-ray and used some of the material here to supplement it. I don't think they had enough new things to say to warrant another theatrical release. Yes, the topic is an important one, but this release is more for those who are already on Gore's side of things and even then, no different solutions to the problem are offered other than the ones we already heard the first time around - making this sequel less "inconvenient" and more "unnecessary." An Inconvenient Sequel: Truth to Power arrives on Blu-ray in slightly inconvenient packaging. It's completely cardboard and made from 100 percent recycled materials. The back cover featuring a circular cardboard sleeves that holds the disc in place is thankfully much thicker than the front cover, so despite the rather annoying (albeit environmentally friendly) package design, potential buyers shouldn't have to worry too much about disc damage. The inside left of the cardboard case contains a list of "10 Ways to Act" that viewers can perform in their own lives to help the environmental cause. There were two inserts in the copy sent to me by Paramount: one containing a code for an UltraViolet and iTunes digital copy of the movie, and the second a small piece of paper with information on how to download a viewing kit in order to host a home screening of the film. I guess this is one of those rare instances where a studio is actually encourage you share this with your pals instead of having them buy their own copy. The movie was obviously shot digitally, although I was unable to find out online what types of cameras were used. By best guess is that different cameras were used depending on the location, as the quality of the footage varies from scene to scene (including some archival footage which is - obviously - not as sharp as the rest of the movie). Overall, this is a pretty decent transfer. The best images - as you might have guessed - occur when the film crew is in the great outdoors, including some wonderful footage early in the movie when Gore takes a trip to Greenland to check out a melting glacier. Indoor shots get a little noisier, particularly the ones that are not as well-lit. Aside from a mild touch of banding here and there (and, of course, the poor-looking archival footage I already mentioned above), there's no major complaints to be found. A pleasant looking, if unremarkable, transfer. The featured audio here is an English 5.1 DTS-HD Master Audio track that - given the movie's focus on a lot of scenes that feature either Gore just sitting and talking to someone or making a presentation to a group - doesn't allow for a whole lot of showing off. The track is heavily weighted to the front, with only a few ambient noises creeping into the rear speakers when the movie moves outdoors to various locations. The rears are also used to enhance the rather "meh" soundtrack from the usually impressive Jeff Beal. With the above in mind, there are also no noticeable problems or glitches with the track. Like the video quality, the audio is about what would be expected for a documentary of this type. In addition to the 5.1 lossless English track, an English Audio Description track is also available, as are lossy 5.1 Dolby Digital tracks in Spanish, French, and Portuguese. Subtitles are an option in English, English SDH, Spanish, French, and Portuguese. Effecting Change: Speaking Truth to Power (HD 26:43) - This is primarily a look at the impact of the original movie and how the decision was made to move forward with this sequel. 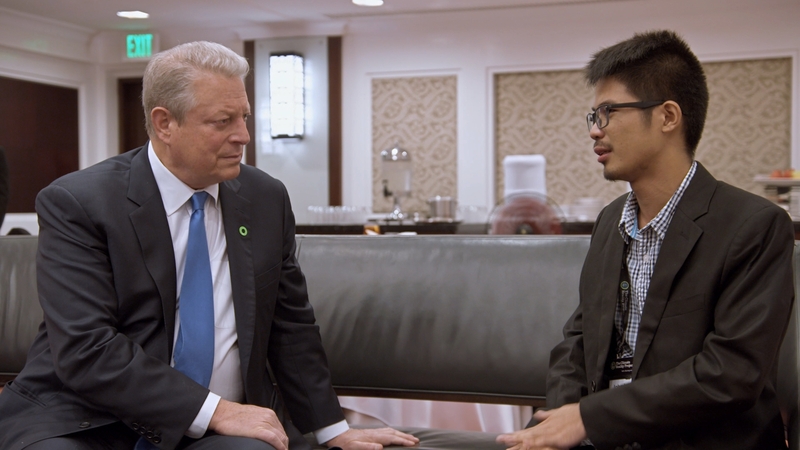 It's a nice supplement to the movie and includes more footage of and comments from Al Gore. Honestly, some of the stuff presented here would have been better served if made part of the actual movie, but at least those coming to the title for the first time on home video will get to see this material. One Republic - Truth To Power (Lyric Video) (HD 3:42) - This is a music video (with the lyrics on screen) for the song that plays over the end credits of the movie. Truth in Ten (HD 11:29) - Al Gore gives a presentation to a small group of about 20 or so people. This is more or less a condensed version of the message he tries to get across in the feature movie. This segment also includes a brief introduction aimed directly at the home viewer from Gore. An Inconvenient Sequel serves more as a companion piece to the original 2006 movie than a movie that offers any new groundbreaking revelations. It tells viewers what has happened in the past decade, for ill and for good, in the battle against global warming, but doesn't really have the impact the first movie did. It's worth a look, but is overall too unfocused to recommend beyond that. Rent it.